GROWTH INDUSTRY Bay Area immigrant detention centers are booming under President Trump. As fallout from the Trump administration's family-separation immigration policy plays out along the Mexican border and around the country, local elected officials are increasingly engaged in an effort to determine the status of undocumented youths currently housed at a handful of Bay Area immigrant detention centers. One of those centers, the BCFS Health and Human Services facility in Solano County, was sued by the American Civil Liberties Union last August, along with Attorney General Jeff Sessions and numerous federal immigration officials. The Fairfield facility is one of several youth detention centers operated by the San Antonio–based nonprofit company, which this year received $121 million in federal grants to house unaccompanied minors and other migrants. According to an Open Secrets investigation, $3.9 million of that $121 million was for housing for 18 males in California. According to the Federal Register, in February of this year the company received an additional $15 million in federal funds to help President Trump implement his "zero tolerance" policy for asylum seekers from Central America crossing into the United States through Mexico. The money was earmarked for BCFS to provide an additional 450 beds. The Fairfield Health and Human Services facility is used to house undocumented immigrant youth from various Central American countries, who, according to the ACLU suit, were mostly rounded up more than 3,000 miles away under the guise of a "gang crackdown." The ACLU alleges that the male youths were sent to privately owned detention centers and denied immigrant benefits and services because of "flimsy, unreliable and unsubstantiated allegations of gang affiliation." One youth who wound up at the Fairfield detention center, identified as "F.E." in court documents, is an El Salvadoran teenage refugee who was living with his mother and step-father on Long Island, N.Y., when he was arrested by local Suffolk County police and turned over to Immigration and Customs Enforcement (ICE). Under the aegis of the federal government's Office of Refugee Resettlement (ORR), he was sent to a Virginia detention center, then to the Fairfield facility before finally being transported to an ORR contracted facility in New York. He is one of numerous youth from an immigrant-heavy part of Long Island who were, charges the ACLU, "arrested, denied access to family and legal counsel, transported far away from home and held in jail-like conditions for weeks on end without any process through which they could challenge their confinement or deny gang affiliation." Earlier this month, U.S. Congressman Mike Thompson attempted to visit an unidentified detention center and was rebuffed by the federal Department of Health and Human Services. Thompson sent a letter to HHS Secretary Alex Azar, saying that it was "unacceptable that you have denied my request and are doing a bureaucratic shuffle aimed at covering up the tragedies of the president's policy of separating undocumented families," as he implored HHS to switch course and provide access. On Monday this week, Thompson and U.S. Rep. Mark DeSaulnier toured an HHS facility in Contra Costa County. In a statement, Thompson noted the high standard of care at the center, but said that "no amount of care at these facilities can make up for the fact that children are being subjected to the harmful and lasting trauma of being separated from their families." His office did not respond to questions related to the Fairfield facility. Last week, two Bay Area women and other volunteers attempted to bring food and supplies to the undocumented migrant children being held at the BCFS facility in Fairfield, which is located in U.S. Rep. John Garamendi's district. Local media in Solano County reported that the women, Elizabeth DeCou and Jesse Inglar, were from Berkeley and part of an organization called Solidaridad con Niños. DeCou was arrested and charged with trespassing. Garamendi spokesman Dillan Horton says the congressman, who was on the Mexican border this week before returning to Washington, has a "general concern about what conditions these kids and families are in, in general across a variety of facilities across the country." He emphasized a concern over the mental health of the children being detained, "and the degree of access—it's valuable for the kids to have access to the community and for the community to have access." 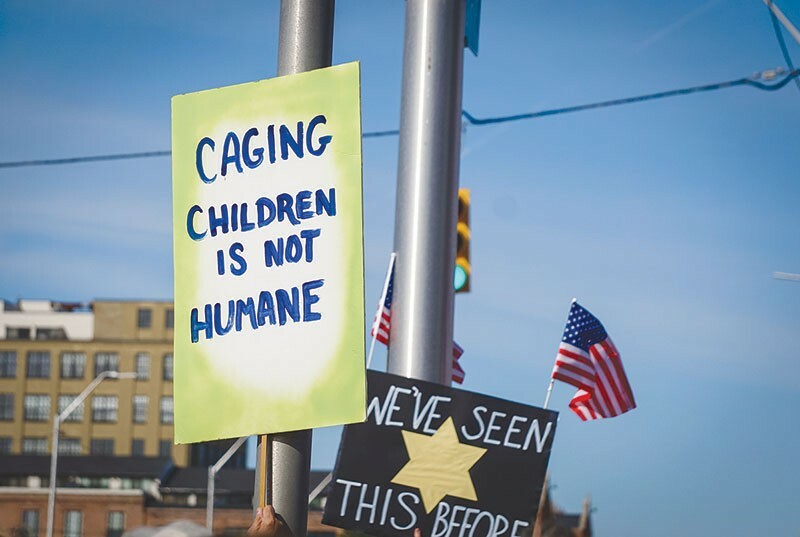 A report on July 4 in the New York Times highlighted links between numerous privately run detention facilities for undocumented youths, and the Trump administration. It reported that BCFS's board members include former U.S. Rep. Henry Bonilla, who was on the shortlist to be Trump's secretary of agriculture, and lobbyist Ray Sullivan, who was Rick Perry's chief of staff when Perry was governor of Texas. Perry is now Trump's energy secretary. As the family-separation crisis grows, the company has pushed off media inquiries to the ORR or other federal agencies, but told the Times on July 4 that its work had "spanned Democratic and Republican administrations." The Fairfield BCFS Health and Human Services facility opened in 2009 when Barack Obama was president. The number of children in the ORR program averaged around 7,500 a year between 2005 and 2011. By 2012, there were about 13,000 youths in the program, and by 2015 there were close to 35,000, according to a recent audit of BCFS undertaken by the HSS Office of Inspector General in 2016. That audit determined that the company's Texas centers had overbilled the government by more than $600,000. BCFS disputed the results of the audit. In 2010, the state Department of Social Services Care Licensing Division sued to close the privately owned facility, which was the first apparent BCSF youth-detention-center foray into California. The state regulators argued that the facility ran afoul of state laws governing child center regulations. Court documents indicate that the suit stemmed in part from the state charging that BCFS was monitoring detainees' phone calls, and that the company violated a state regulation which said the youths could not "be locked in any room, building or facility premise at any time." The state did not prevail in its effort to shut the facility down, and in its response to the suit, BCFS lawyers argued that the state didn't consider "the unique concerns and issues relating to the children residing at the BCFS facility, such as the criminal history associated with some of the residents and their illegal status." Anti-immigration organizations took an interest in these facilities before Trump was elected. In 2014, the far-right organization Judicial Watch filed a Freedom of Information Act request with the federal Health and Human Services which sought information on numerous detention centers then being utilized to house the undocumented. The FOIA request was completed in 2017, and the documents are mainly incident reports from immigrant detention centers around the country, including the Fairfield BCFS facility. The FOIA request spanned several months in 2014 and incident reports from Fairfield indicate that there were several instances of alleged sexual abuse or inappropriate sexual behavior committed by youthful detainees against other detainees. Another incident report states that a Mexican detainee at the Fairfield facility was threatened with a beating by an ICE officer for not signing an English-language document the detainee did not understand. The federal Department of Health and Human Services released the incident reports at Fairfield and other unaccompanied-minor detention centers to Judicial Watch on July 14, 2017. The ACLU filed its lawsuit against Sessions and the BCFS Health and Human Services less than a month later, on Aug. 11, 2017. The focus on California detention centers this month is being undertaken just as a federal judge in California upheld most of the legislative pieces that bolster California's push to become a so-called sanctuary-state. One of the laws that was upheld was AB 103, which empowers the state to review the federal detention of immigrants in the state. State Sen. Bill Dodd represents Fairfield and says that "the federal government should be doing everything possible to reunite these children with their parents," and applauded the federal judge's ruling that prevents ICE officials from detaining immigrants seeking asylum. "The decision vindicates the premise that the state of California shouldn't be forced to pay for federal immigration enforcement," he says. "I hope the federal government comes together to adopt thoughtful, humane reform." Dodd's office says he doesn't have all the facts on the Fairfield arrests last week and could not comment. Sheriff Freitas trip to D.C. cost Sonoma taxpayers $2,522.90. Plus: ICE and SCSO.